GFA is committed to serving the "least of these" in Asia, often in places where no one else is serving, so they can experience the love of God for the first time. GFA partners with the Church worldwide to support national workers, equipping them to serve as the hands and feet of Christ in four main ways. GFA trains and equips national missionaries to minister to those within their own cultures. These humble servants of God minister to people's deepest needs, both physically and spiritually, in countries that are largely closed to Western missionaries. More than 70,000 children from impoverished families are being given hope and a brighter future through GFA's Bridge of Hope Program. 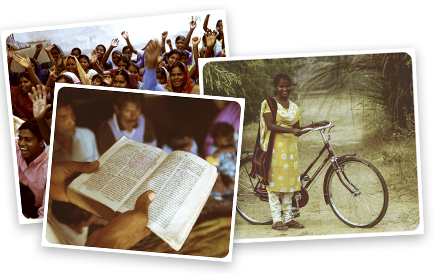 This sponsorship program provides a way for children in India, Nepal and other parts of Asia to receive an education, medical checkups and more in Jesus' name. Many families in Asia do not have the basic necessities for healthy living. GFA-supported workers help meet these needs by providing things such as clean water, income-producing farm animals, sewing machines and vocational training. GFA-supported national workers serve victims of natural disasters and those who are often rejected by society, such as widows and leprosy patients. These Compassion Services teams love the Lord and serve the needy from that same heart. For more information, visit: www.gfa.org. Questions, comments or concerns? Let us know. We're always looking to bring the Road to Reality radio program to more places! Please enter your information below. Thanks!